I have never been much of a lunch person, preferring to rather invest my finite enthusiasm for cooking towards crafting a decent dinner. I suspect that my mid-day apathy is rooted in my years growing up in Malaysia, where lunch was pretty much a no-brainer as it invariably meant one thing: noodles! Beef Hor Fun, wonton mee or Char Kway Teow – a noodle obsession is easy to feed when you live in what is arguably the noodle capital of the world! Alas such lunchtime bliss is now 9000km away and my choices are somewhat less appealing these days. Here in South Africa a ‘sarmie’, pie or a plate of chips are typical lunchtime fare and needless to say, I would rather do without. Nevertheless, a man has still gotta eat so I found myself falling back on old Malaysian habits and having noodles for lunch, albeit nowadays I’ve been reduced to a bowl of a jazzed-up noodles of the 2-minute variety. More recently, however, I have been trying to cut down on complex carbs so even my trusty instant noodle-lunches have been a rarity of late, which is all well and fine, but this has led me back to my initial lunchtime conundrum: what the hell’s for lunch? For the most part this has meant soup and these days my bowl of choice is minestrone. Since my carb-cutting I’ve eaten a lot of minestrone but as delicious as it is, there is only so much soup a man can sup! Desperate to move back to solid foods I searched high and low looking for a meal that was fast, tasty, filling and, above all, didn’t sabotage my diet. I had almost given up and was about to resign myself to my soupy fate until culinary salvation arrived in the form of a Men’s Health magazine (of all things). Okay so the featured recipe was pretty basic, but it was ripe with potential. It was exactly what I had been looking for, it was just a tad dull (after all, it was inspired by a Men’s Health recipe), but with a just a few tweaks I knew I was on to a winner! Firstly, I added some coarsely grated baby marrow (courgettes) into the mix, then some finely diced fresh red chilli and red onion and everything was topped with a dollop of plain fat-free yogurt and a crack of pepper: the perfect low carb/high protein lunch in under 5 minutes! With my preferred noodle-lunch still 9000kms away, this sounds like a near-perfect lunch to me. It was only when I finally moved to Cape Town to be with my partner that I realised I had, in fact, moved in with my own private flavourphobe. From the very first meal I made us, it was abundantly clear that any thoughts I may have been harbouring about bringing about instant flavour-reform to his palette were a complete waste of time. His tastes preferences were set and I would simply have come to terms with the fact that there wasn’t going to be a belacan-epiphany or a glorious moment of garlic-redemption on the immediate horizon. Regardless how I felt about it, I had made my proverbial table so, for now at least, I was just going to have to eat at it. For the first few months I dutifully made the plain dishes he enjoyed, but like all good spouses I was really doing what we do best – biding time. An errant garlic clove here, an extra splash of Worcestershire sauce there, little by little I tested the waters and after a while I began to introduce new dishes for his consideration. Some of these offerings were more successful than others, some were downright disasters, although with hindsight the roasted lamb with anchovies was particularly ill considered! And then I discovered the recipe for this incredible stew. On paper Idaho Stew fit the bill perfectly; it was a simple, old school beef braise with one small twist – it had coffee in it! It may seem minor now, but please remember that, culinarily speaking, South Africa was a very different place back in 2000. Back then the mere notion of sushi was downright provocative and the thought of cooking a savoury dish with coffee was considered, at best, daring to most South Africans (let alone my dearest flavourphobe)! So yes, back then this humble stew was a risk, but I had to try it, lest I be condemned to making sausage, peas and mash for the rest of my life. So one night I bit the bullet and dished up my ‘daring’ new stew for dinner. With baited breath I watched as he eyed my latest offering with understandable suspicion. “What is it?”, he asked. “Oh, nothing weird, just a stew” I said, in what I hoped was my most casual voice. “Hmm, okay”, came the reply. Clearly he wasn’t convinced, perhaps the lingering trauma of that damn anchovy lamb was playing on his mind. In spite of his obvious suspicions he took a bite, albeit tentitively and after a moment of furrowed consideration he took another, then another – the stew was hit! It was only once his plate was cleared that I dared divulge the contentious ingredient. “Coffee? Really? You can’t taste it”. Wow, he was taking this surprisingly well. “You can definitely make this again”. “But next time may I have it with rice and not mash?”. Sigh. Okay, so you’re still a freak, but I’ll take the win. To this day Idaho Stew remains a firm favourite in his limited pantheon of acceptable meals and I still make it often, although he normally refers to it as “his coffee stew” suggesting a secret revelry in the kudos of his expanded palette. 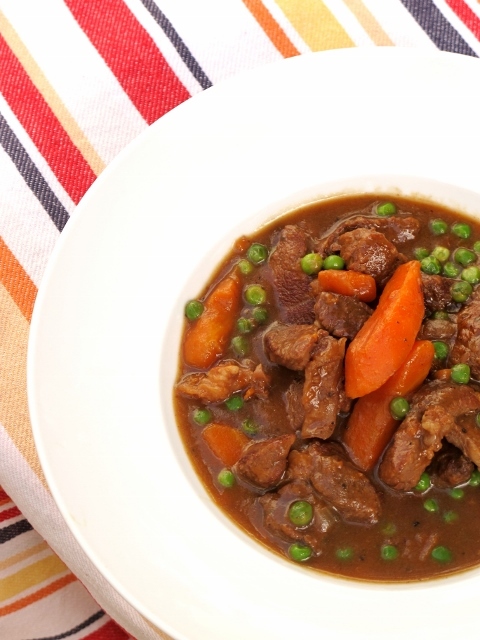 These days I usually have a couple of handy portions of this stew in the back of the freezer which I whip out for my partner when we have guests and the menu isn’t to his taste. Unfortunately, this seems to have given his much loved “coffee stew” a bad rep as one of “Brian’s meals”, which is, frankly, simply a byword for dull. Nothing could be further from the truth! This rich stew is chock full of flavour and should appeal to the whole family…whether or not you dare to tell them that the secret ingredient is coffee is, of course, entirely up to you! Being half Asian I naturally adore food packed with flavour and usually in my kitchen that means spicy and exotic, but sometimes I crave the simple home-cooked comforts of my mother’s land. It may be the inner-Brit in me, but there are days when you can just keep your kimchi and beef rendang – all I want is toad-in-the-hole or a proper Sunday roast! Without a chilli nor spice in sight, this dish is the epitome of what I would call real British comfort-food. Made with just a few seemingly unassuming ingredients, this humble stew seems to come out with more flavour than was put in! Uncomplicated and yet rich with depth, this dish is the perfect example of good food, made simply. 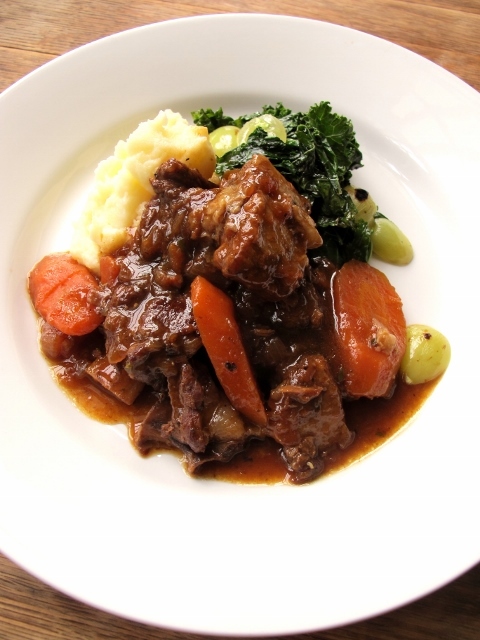 Adapted from Leiths Meat Bible, this amazing braise goes well with just about anything. Feeling sophisticated? Serve it with classic mash potato and some sautéed kale with grapes. Feeling rustic? Just grab some fresh crusty bread and mop-up the delicious sauce! Kimchi and beef rendang? Lord knows I still love them, but when old-school British comfort-food tastes this good, you could be forgiven for never wanting anything else! Inspiration is occasionally born out of apathy and the origins of this tasty meal were no different. Feeling particularly uninspired one evening, I decided to forgo my usual practice of preparing two completely separate meals for dinner and instead decided to do the unthinkable – eat the same dinner as my partner! Now please bear in mind that this dining-convergence doesn’t happen often in my kitchen, very rarely in fact. We have wildly different tastes and normally I’m happy to make us different dinners every night, but there are occasions when I justifiably just think, “sod it” and we end up with the same meal. At least almost exactly the same, I always have to tart my own meal up, just a little! 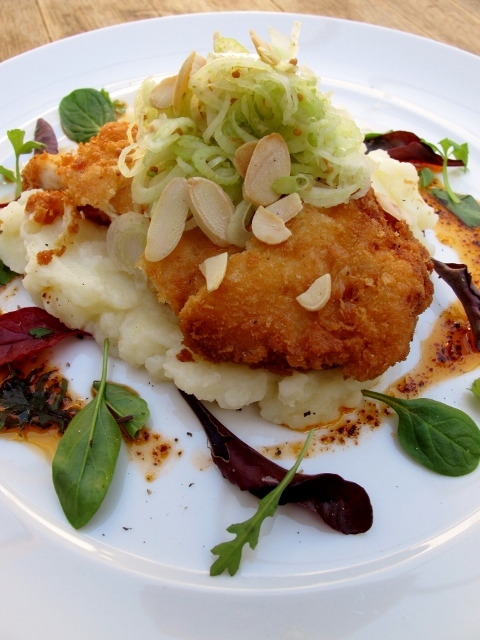 So, “Chicken Schnitzel with mash” for two it was then! Now I must confess that the very first time I made this dish it was with some horrendous ready-made Chicken Schnitzels, wrestled from the frozen depths of my freezer. Indeed I had sunk so low, but like I said, “apathy = inspiration”. But even in this heightened state of disinterest, I still needed something to spruce up this dire meal, so I set about rummaging through the fridge. I was looking for quick fixes and I found some; leftover pickled fennel that I had made for Kimchi Tacos – sorted! Things were starting to look up. It was only then that the inspiration started to kick-in; some toasted almond flakes were added to the fennel and Sichuan Chilli Oil, leftover from when I last made Dan-Dan Noodles, found its way onto the plate! Whilst this was fast turning into an inspired concoction, the addition of these two ingredients turned out to be culinary-dynamite! With just a few simple twists this meal went from turgid to terrific! Note: The chicken in this dish has since morphed into Japanese Chicken Katsu, but there is nothing wrong with using good old chicken schnitzel instead (homemade or otherwise). For all extents and purposes Chicken Katsu and schnitzel are pretty much the same thing, but my need to complicate things for myself is, sadly, inherent and overwhelming. The epitome of 80s vogue, everybody over a certain age will remember when Creme Caramel was très chic and the dessert of choice at only the most discerning dinner parties. Sadly, along with the likes of Baked Alaska, Creme Caramel has gone the way of the Prawn Cocktail – largely relegated to dubious theme nights and the occasional bout of culinary nostalgia. Thankfully though, Creme Caramel’s resurrection is at hand. These days there’s a fine line between passé and retro-revival and by simply adding a de rigueur ingredient like dulce de leche, suddenly Creme Caramel has renewed appeal and relevance. From tired to trending with one simple twist on a worn classic! For a “classic” dessert, this recipe is surprisingly cheap to make. Other than the dulce de leche, most of the ingredients are pantry staples: milk, eggs and sugar. All in all, it’s a pretty impressive dessert for not a lot of money! A veritable institution in South America, dulce de leche isn’t always readily available in South Africa, but you can substitute it with something like Nestlé’s Caramel Treat instead. Creme Caramel also has an undeserved reputation for being difficult to make, but this couldn’t be further from the truth! Okay, admittedly the recipe looks complicated, but other than the “tempering” the recipe is actually very straight forward. 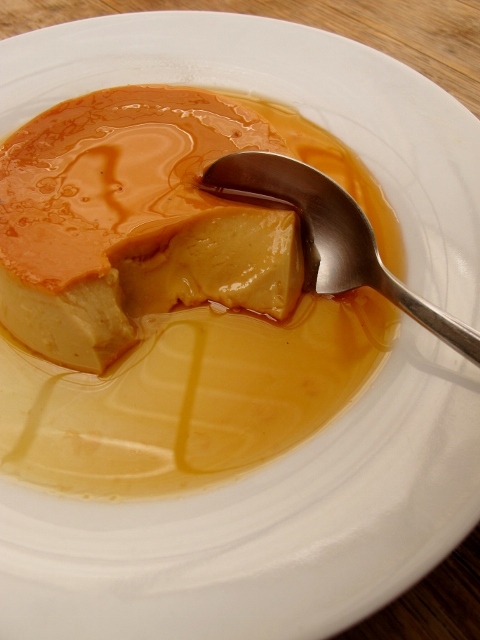 As much as I would love to completely dispel the myth of how tricky it is to make Creme Caramel, I don’t think it’s something we should be shouting from the rooftops. A good dose of culinary kudos is never a bad thing and there’s nothing better than hearing your guests exclaim, “Wait, you actually made this? It’s amazing!”. Yes, I did…and yes it is! Kudos indeed. In a saucepan, combine milk, dulce de leche and salt. Nobody can deny that the once humble cauliflower is the new broccoli. The reigning darling of the health-conscious, and the saviour of “The Cult of Banting” cauliflower’s stock has never been so high. Once only to be found shroud in a béchamel sauce, these days you can find a myriad of recipes for this previously maligned vegetable. 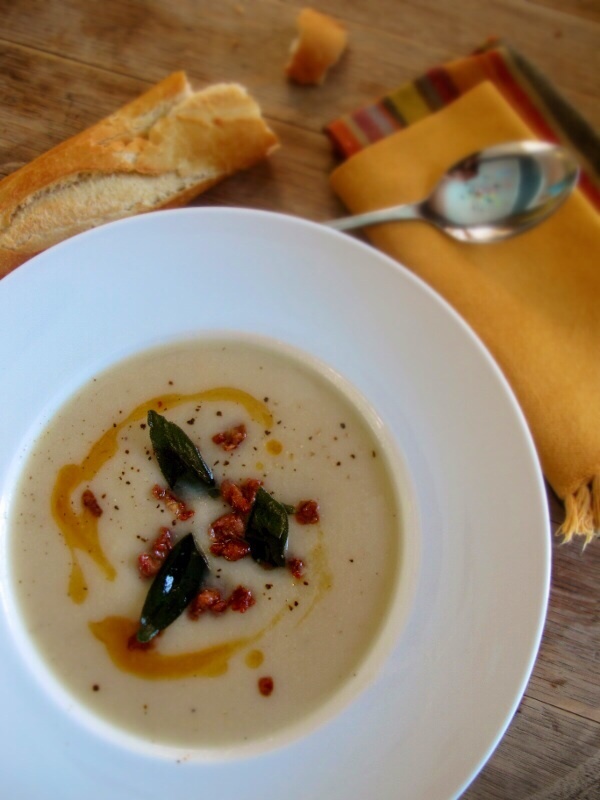 Long before it became de rigueur though, I’d been using cauliflower to make this amazing soup. What elevates this soup beyond just being a bowl of bland puréed cauliflower is the simple addition of caraway seeds. These add an earthy note, giving the soup a depth of flavour that would otherwise be lacking. In addition to some lightly fried spicy chorizo, I usually garnish the soup in a number of ways, depending on the occasion. For an informal meal I would use some fresh flat-leafed parsley, but for a dinner party I would sprinkle over some snipped chives. If I really want to impress, however, I would garnish the soup with some crispy sage leaves. The added texture and flavour takes the dish to an entirely different level. Just make sure you don’t burn the sage! I love this soup; not because it’s trending or good for me, but because it is cheap, easy and surprisingly sophisticated – truly this is a soup for all occasions. Long after the cauliflower’s time in the spotlight is over and it returns to being the humble vegetable it once was, I know I’ll continue loving this recipe, and so will you. Note: being stubbornly pre-Banting my recipe does contain potatoes, but theses are included out of habit and not necessity, so can easily be omitted if desired. I have had more than my fair share of doomed desserts. In fact given the choice, I would happily forgo them completely, or buy-in something instead. I am, however, not a dessert person: never have been, never will be. I would rather have a starter for a “pudding” than a crème brûlée, but I’m in the minority; understandably most dinner guests expect a sweet treat to end their meal, not another bowl of French onion soup! Like any good host I like to give my guests what they want, so I’ve taught myself a few special desserts to cater to their not-unreasonable dining expectations. Which brings me to this particular recipe – chocolate parfait. In my relatively limited arsenal of dessert recipes, this is possibly my favourite. Part ice-cream, part semifreddo; chocolate parfait is entirely appealing but without the hassle of either. Unlike ice-cream, parfait requires no churning or special equipment. Elegant enough to impress, virtually impossible to stuff-up and always deliciously moreish; chocolate parfait is a dessert coup! 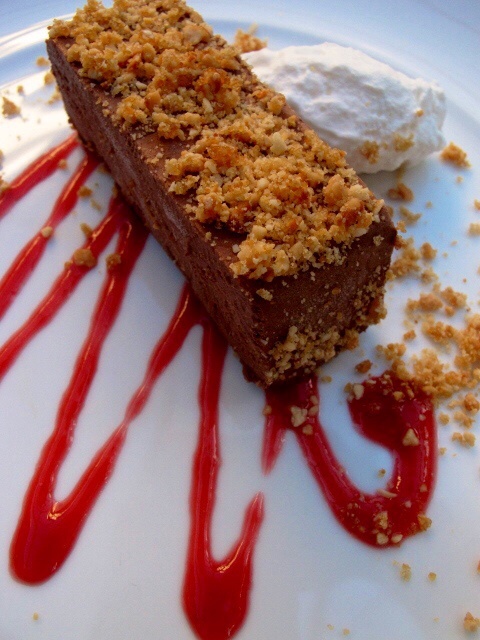 Paired with pecan crumbs, whipped cream and a coulis, this dessert is so delicious even I am tempted to scoff a slice! Some days I just need to have a black pudding fix. Yes, I know many think it’s gross, but my love of black pudding is a cherished hangover from my days when I lived in Newport, South Wales. Back then, I loved nothing more than a visit to my local greasy-spoon cafe, just off the Cardiff Road. This place was the Real McCoy: the accents were thick, the tea was brutal, the vinyl tablecloths slick with grease and the fry-ups were a full-on, no-holds barred affair – even the bread was fried! It may have been a coronary hazard, but was pure greased bliss. Even now the mere thought of fried eggs with baked beans, black pudding and fried bread is enough to make my mouth water and my arteries contract. Thankfully these days I’m slightly more circumspect about my breakfast choices, but now and again I find myself craving a bit of black pudding. More recently however, I have been trying to find new ways of incorporating this maligned British delicacy into my cooking. As a result, it has found its way into various risottos, been served elegantly with smoked haddock and even added to salads; all delicious, but by far my favourite effort has been Black Pud’tanesca! Akin to a punchy traditional Puttanesca, this robust pasta sauce is not for the fainthearted. A gutsy dish, big on flavour, it had me hooked with my very first bite; each successive mouthful was followed by an “oh my God, that’s amazing!”, culminating in a flurry of unashamed plate-licking, a second helping and more “oh my God”s! 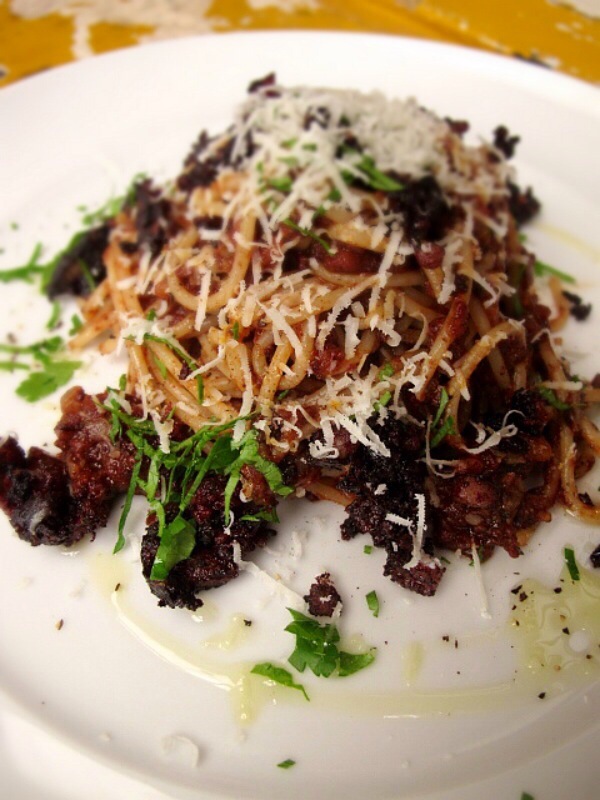 Seriously good, easy to make and impossible to forget, this humble pasta sauce will forever change the way you see black pudding. Be brave and prepare to be amazed; if you’ll forgive the pun, this recipe is bloody delicious! Tired of doing loads of dishes? Need a one-pot wonder meal that even the kids will love? Then this is the recipe for you. 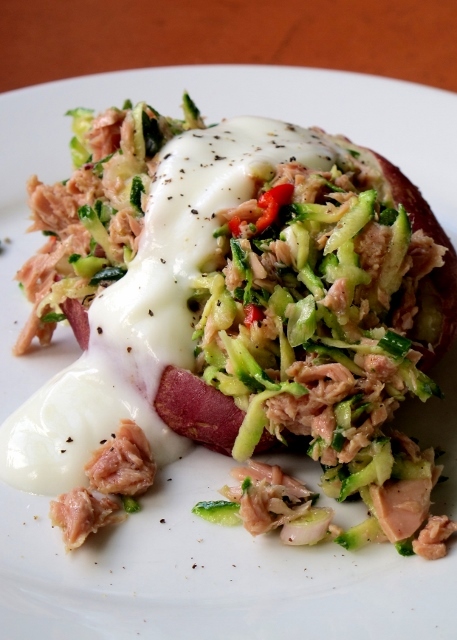 This is simple, relaxed cooking at its best and is sure to become a firm family favourite! Not to be confused with the Greek liqueur Ouzo, Orzo is a diminutive Italian pasta which resembles a large grain of rice. Unlike other pastas that are usually served with a sauce, the orzo in this recipe is actually cooked in the pot along with the lamb and tomatoes. 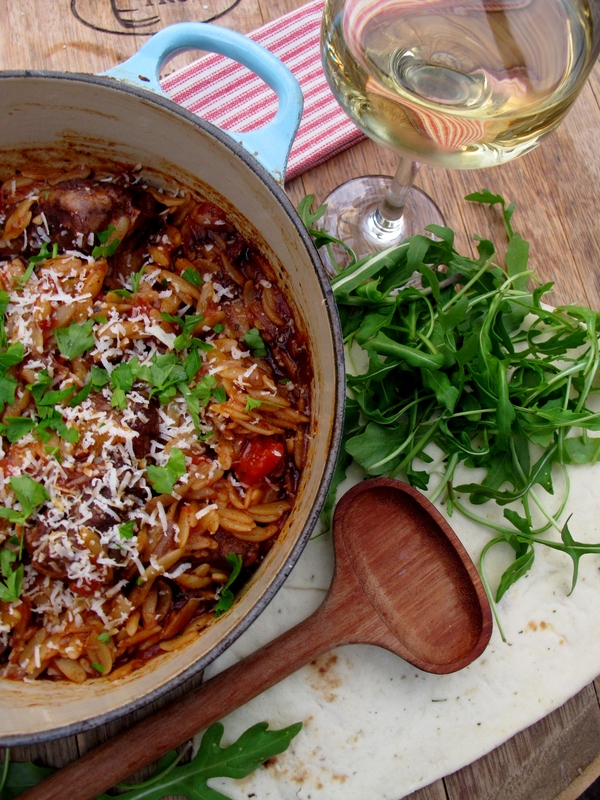 This method of cooking the pasta allows the orzo to absorb the nuances of the sauce, resulting in a dish that is simply bursting with flavour! 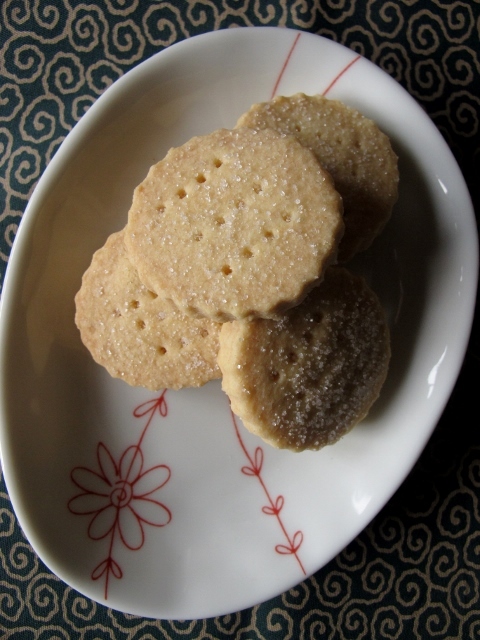 To my mind, of all the sweet treats my mother made when I was young, shortbread always seemed the most luxurious and perhaps surprisingly, the most “exotic”. Set against the kaleidoscope of Malaysian desserts that I grew up with, shortbread seemed the epitome of Western refinement – something the lords and ladies of Windsor would perhaps nibble on, whilst sipping on their Earl Grey at teatime. In a childhood saturated with deep-fried bananas and glutinous purple layer-cakes, there was something about the buttery simplicity of shortbread that echoed a colonial restraint that appealed to my early sense of identity. That my mother made very good shortbread, made me feel different; it, in part, made me feel just a wee bit more British. The secret to my mother’s shortbread is, however, an altogether un-British Asian ingredient: rice flour. This elevates the shortbread to another level; giving it an amazing texture and makes for an even crisper biscuit bite. Note: Try to use rice flour sourced from an Asian supplier rather than from a health shop as the former seems to be finer and gives a better finish.